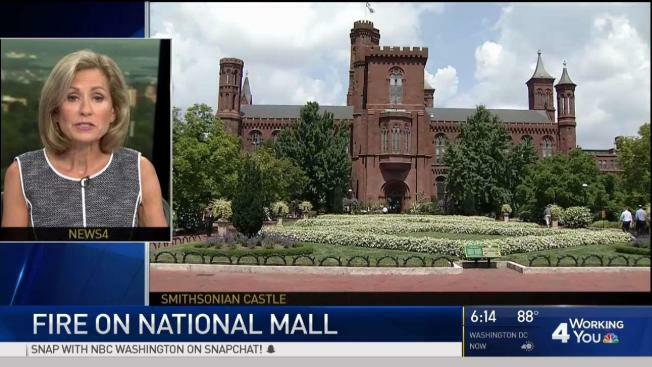 The Smithsonian Castle caught fire and has been evacuated, the D.C. fire department says. A fire broke out on the third floor of the towering, historic building on the National Mall, at 1000 Jefferson Drive SW. The building completed in 1855 may be old, but it's modern sprinkler system worked and extinguished the blaze. No one is reported to have been hurt, the fire department said about noon Wednesday. It occurred in a non-public, staff area, Smithsonian spokeswoman Linda St. Thomas said. The castle is closed for the rest of Wednesday as the area is cleaned. The fire what accidental and "electrical in nature," the fire department said in an update. The castle, also known as the Smithsonian Institution Building, is home to the Smithsonian Institution's administrative offices and information center. It has items from the collections of each Smithsonian museum. No art or artifacts were damaged. The fire department initially said the area where the fire occurred had been under construction; they said in an update that it was not.